Want to learn how to use a wood router but don’t know how? This article will help you learn how to do it safely. 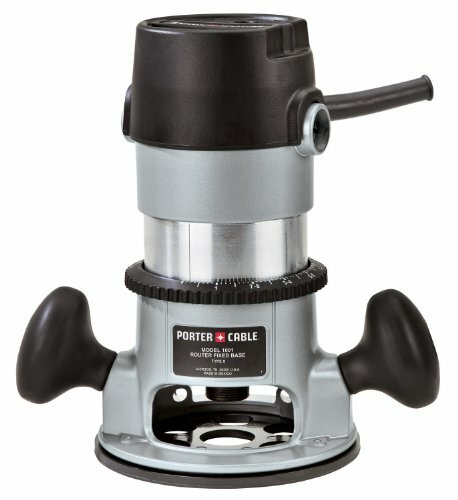 It doesn’t matter if you are going for a professional woodworking career or you just want to have some with an electric router. You can have so much fun with a wood router; all it takes is some skill and a lot of creativity. So let us not waste any more time and start learning how to operate a router like a professional. Before you even think about using a wood route﻿﻿﻿﻿r, you need to have some knowledge about safety procedures, electric router components, etc. Once you get to know this woodworking tool, you will be able to operate it. Therefore, here are some of the most important components and safety concerns you should note. In general, we could divide router types in two categories. Which one you choose to operate depends on your personal preferences, and sometimes the work you need to do. Fixed base router – This router provides easy bit adjustments and replacement. Once the bit is in and you lock the base, there are no changes in bit depth. The bit will stay fixed in its position. Plunge base router – This type of router enables you to manipulate the position of the bit. This means that when you operate this type of router, you can plunge the bit in and out of the material. This is a great tool for complex woodworking tasks. There are multipurpose kits that offer the choice between fixed base and plunge base. They have a motor that is compatible with both types of router base. This can be very useful asset if you are using a wood router for various purposes. To operate safely, you need to know when and why your bit rotation speed needs to change. It is not the same when you are using a large diameter bit and a smaller size bit. For your safety and for the sake of your woodworking, larger diameter bits require slower speed. You do not want your bit to overheat or burn the material. Using a wood router asks for some safety measures. That is why you should always have some gloves and safety glasses close by. In addition, if you think that your wood router is too loud for your sake, use antiphons. This will keep your hearing undamaged; nobody wants to hear ringing after they have finished working. There are some differences between router shank dimensions you should be aware of. Some router bits come with a quarter-inch shank, while others have a half-inch shank. If you are asking which one is better, half-inch shank provides more stability and cleaner cuts. This means that while you operate your router there is less chance that the bit will come loose. Cleaner cuts mean less sanding when you finish your initial work. It is fair to mention that some router bits have an 8mm shank size. In order to use this bit you need to place a reducer into a half-inch collet. Now that you know everything there is to know before you start using a wood router, it is time for work. Make sure that you have your protective glasses and gloves on; this will prevent you from any unwanted injury. Your eyes are exposed while working and there is a chance of something falling into your eyes and hurting you. First, make sure that your router is not plugged in into power outlet. This is very important if you want to avoid being electrocuted by accident. Once you are sure that your router is not going to kill you with electricity, remove the base. When you remove the base, you will be able to insert the proper bit into the collet. Make sure that you place 2/3 of the bit length into the collet and tighten it properly. Clamps – You can just clamp the material to your table and this will keep it fixed in one position. On the other hand, the clamps might get in your way while you are working. So think about it before you decide for this option. Router mat – This is a special mat that you can spread on your work desk and place the material on top of it. The mat will keep the material fixed and give you full freedom of movement. If you feel like the mat is not holding the grip as before, just clean it up. Sometimes the dust prevents the mat to have a strong grip, and some rinsing takes care of that issue. This is extremely important in cases where you need to rout all four edges of a board, for example. What you want to do first is start on end grain. As the bit exits, even if you chip adjacent edge, you will clean up any chipping while routing that edge. When you finish routing your material, sometimes it takes some sanding and polishing. Make sure that you use proper sandpaper and that you do not overdo it. Use those final changes to make your project smooth, it will also prevent chipping in the future. This tool is a must have for any woodwork shop. It gives you so much pleasure and it will make your life a lot easier. It doesn’t matter if you are a professional or you need it just for hobby. It is only important that you pick the right type for you, with right set of bits and you are good to go. There are many fun and exciting projects you could compete with an electric router. Follow safety procedures, keep in mind that your safety comes first. Use your tool properly at all times and create amazing projects for you and your loved ones. If you are a professional, make sure to perform proper maintenance. And don’t forget to tell us in the comment section about your favorite router type. Also, feel free to share with us what exciting projects you are planning to complete with your wood router.